Russian President Vladimir Putin told reporters on Wednesday he is willing to release transcripts of the White House meeting between President Trump and Russian Foreign Minister Sergey Lavrov. The Kremlin also said reading US newspapers is dangerous. 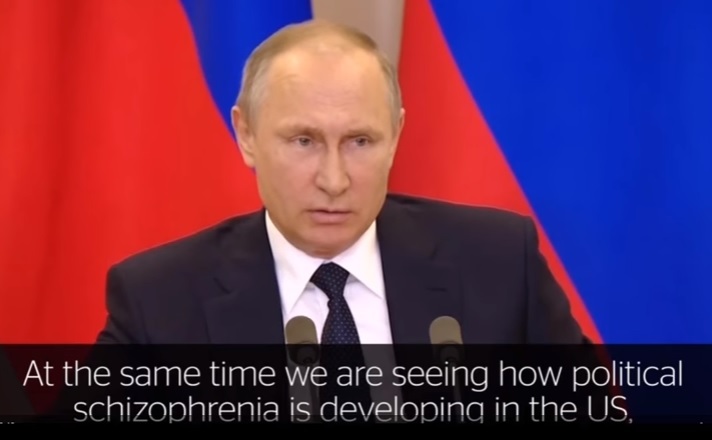 Putin made the remarks on Wednesday. Russian President Vladimir Putin says he is ready to provide records of the recent meeting between US leader Donald Trump and Russian Foreign Minister Sergey Lavrov, to dispel the “political schizophrenia” around the allegations that state secrets were leaked. “If the US administration deems it possible, we are ready to provide the Senate and Congress with the transcript of the conversation between Lavrov and Trump,” Putin said at a press conference, following a meeting with Italian Prime Minister Paolo Gentiloni on Wednesday. Kremlin aide Yury Ushakov followed up on Putin’s statement with a clarification that there was no audio recording at the Trump-Lavrov meeting, and the only form of record available is a transcript.